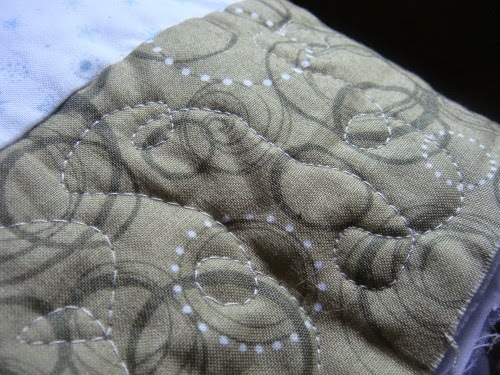 Remember this sneaky peek that we showed you recently? 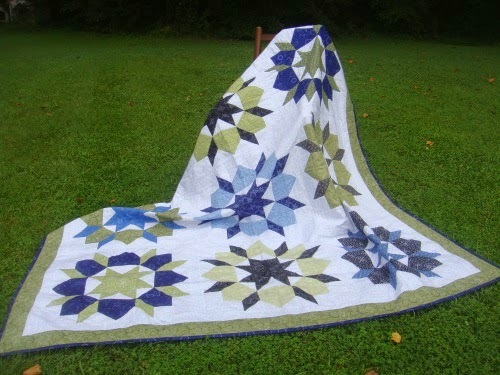 Well, a new Block of the Month is coming, and boy, is it going to be fun! See that button on the right hand side bar? We are one of the team! Ribbit! 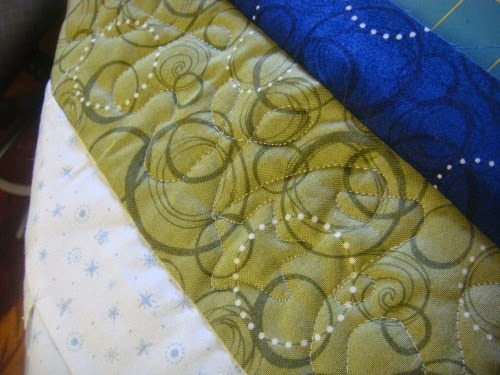 We are going to have sample blocks to show you as each month goes by! 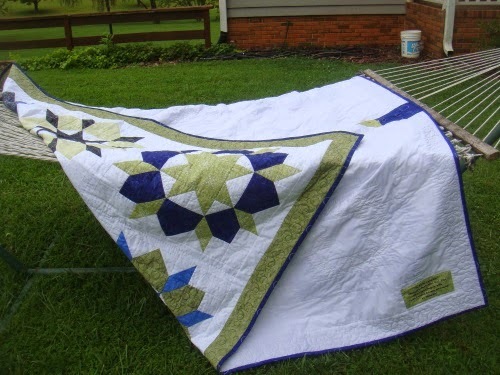 I hope that you will check out this post over at Jacquelynne's blog and join us, OK? Sign up to get her emails and you will be in the know when we get started! And if you are going to join us, place that badge on your blog so we'll know! 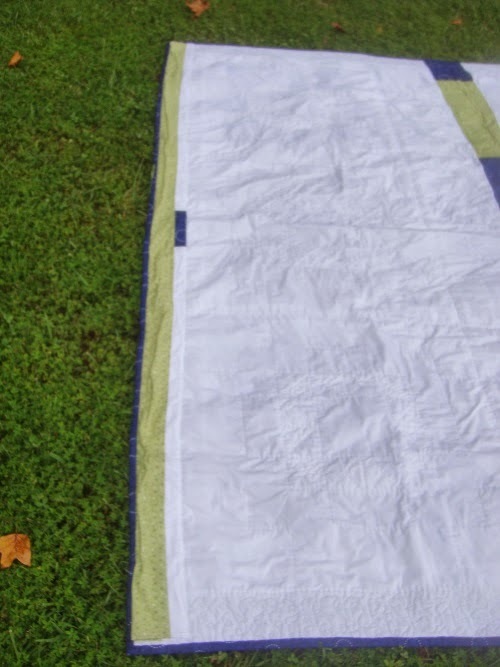 Jacquelynne has posted fabric requirements and everything, so that you can be ready to start! 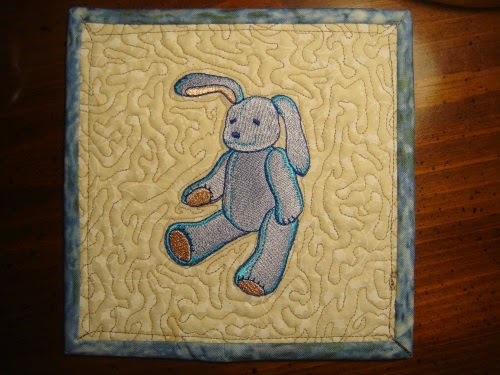 The lovely Rhonda over at Ravelly1 blog has giveaways for her cute mug rugs that she creates. 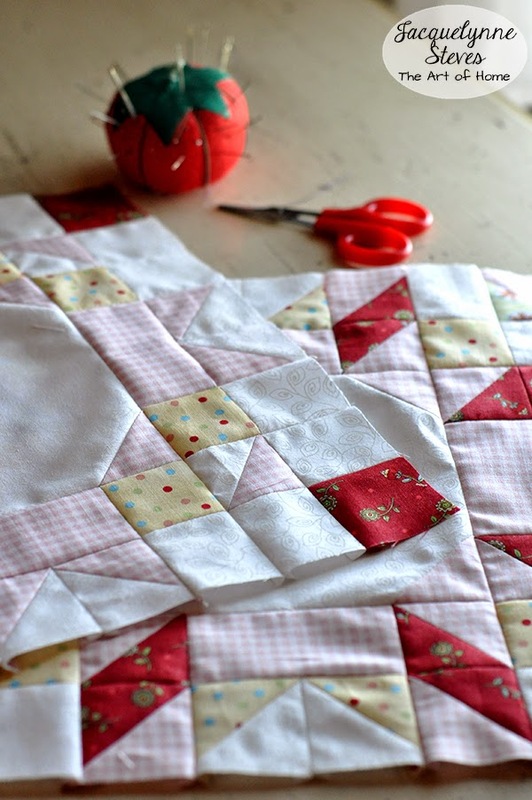 You really should pop over and see what she's up to, for there are some wonderful Block-of-the-months, designs and tutorials for you to look at! And the bunny came home to stay with me! Woot! An adorable spot for my cuppa joe to rest in the early mornings at my desk! 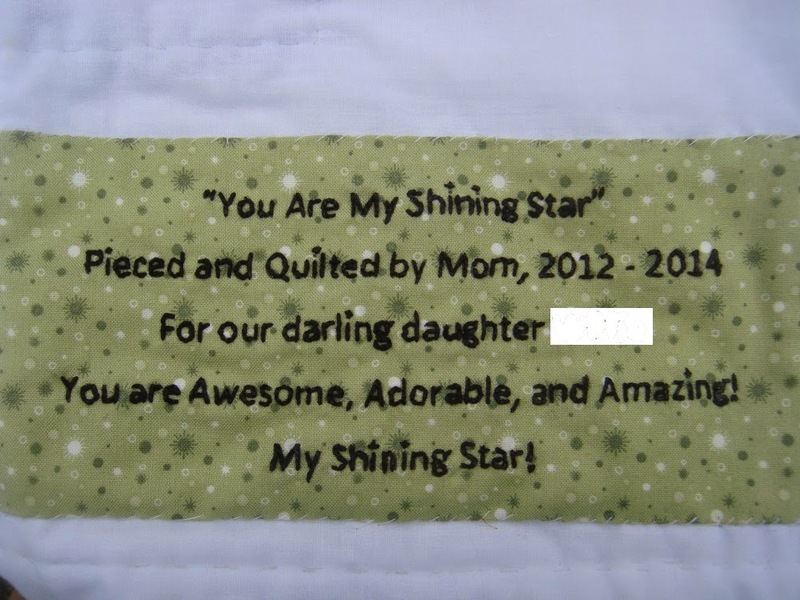 You are just one of the reasons this virtual quilting community is SEW wonderful! 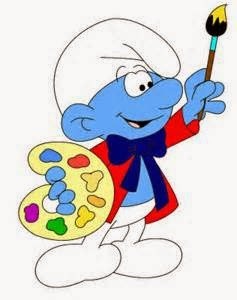 I'm channeling my inner Painter Smurf today . . . 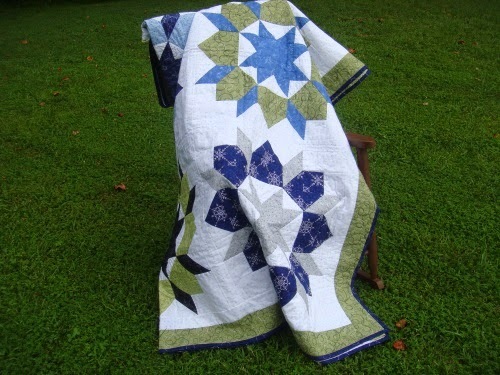 I guess that is the way I feel every time I finish a quilting project. I know, right? You do that too? 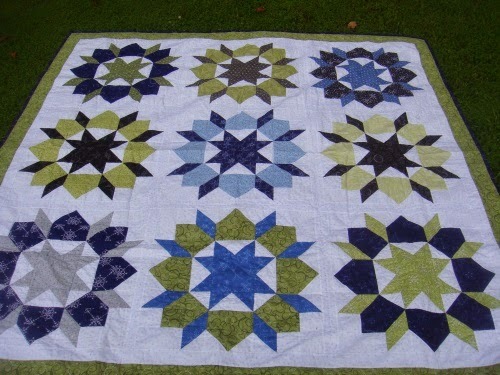 I thought I would show all of you my latest finish. It only took two years. (Quit snickering at me.) 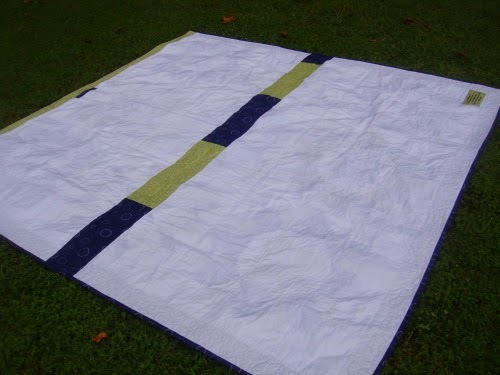 It is going to hang on the wall of a loft apartment, so it was made with silk batting to make it very light. 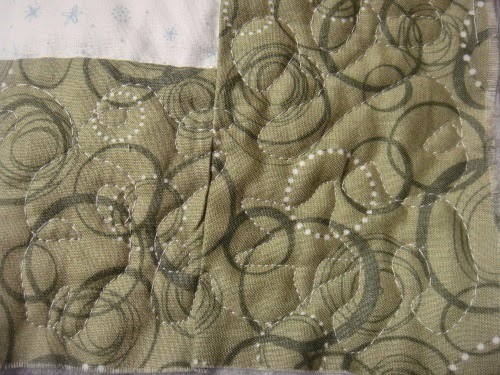 Aurifil thread was used throughout, since I hope this will be a treasured quilt for a long, long time! 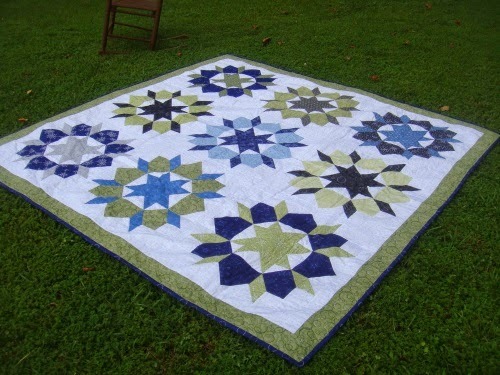 I have not attained Quilt Photographer status yet, so you will have to forgive the amateur pictures at my photo shoot! 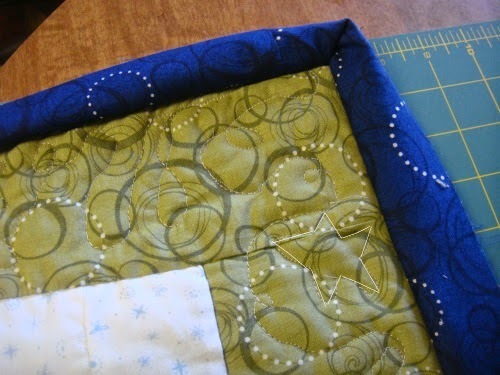 Here is a shot of the binding being applied -- I love, love the pop of the blue against that green border! 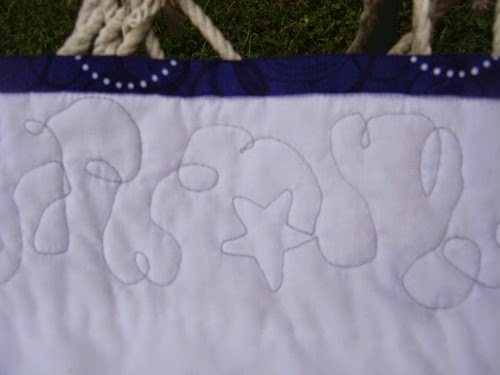 Speaking of the border, here is a closeup to show you the fabric...the lighting makes it look more gray here, but the shot above shows the true color. 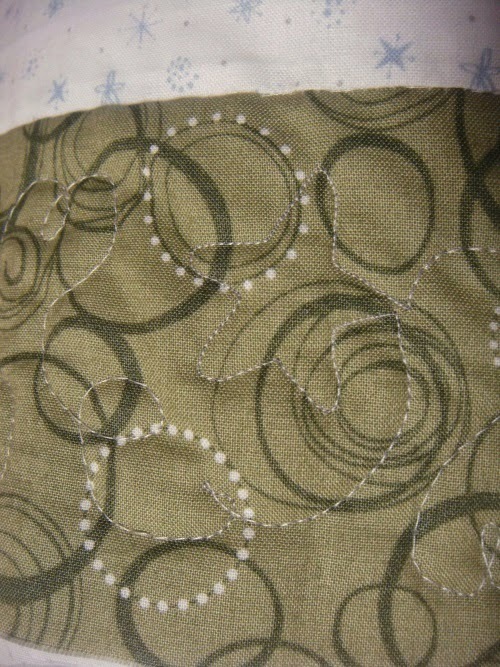 The entire quilt was pieced with Aurifil thread, and I hand-quilted almost all of it using a lovely gray. 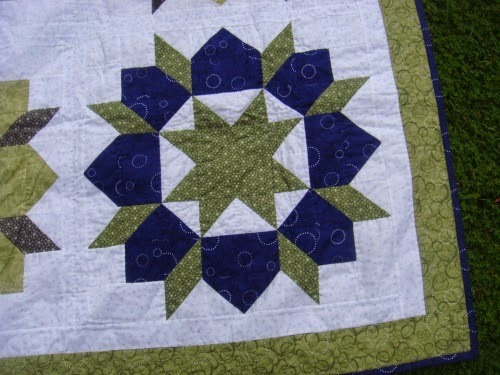 Then I loaded up my machine with the Aurifil and made loops and wonky stars in the border....you will see why, later! 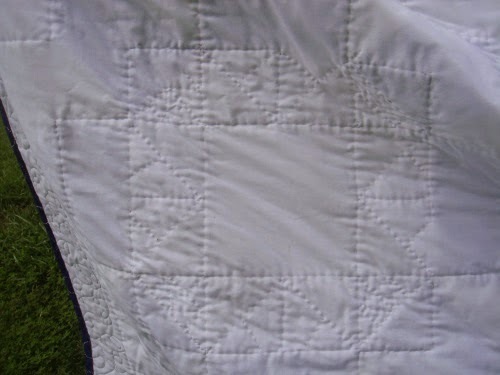 You can see the gray quilting better on the back side. See the star? Oooooh, that's a nice shot! So now you have seen my masterpiece! Two years in the making, and now it is hanging in a loft with twelve foot ceilings! And me? I'm happy dancing!